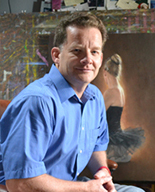 Martin Pate graduated with honors from Ringling School of Art in 1981. His figurative works won acclaim in the Sarasota area by such notables as Thornton Utz who declared a life drawing by Martin as the best work in the 1981 student show. His love of figurative works has led to numerous portrait commissions over the last 25+ years by clients throughout the United States. Recent portraits of South Carolina Governor Jim Hodges' children hung prominently in the Columbia, SC mansion during his term. Martin’s ability to paint people has also led to more than 20 years of commissions by the National Park Service. Working with archeologists and the Southeastern Archeological Center, Martin has created paintings of pre-historic Native Americans, Civil War battles, The Battle of the Little Bighorn, Underground Railroad scenes and various others. These images have been used for a variety of educational purposes including books, posters, interpretive panels and CD ROMs. These works were recently compiled in a book by SEAC director John Ehrenhard. "The Art of Cultural Resource Management" is a compilation of more than 12,000 years of this country's amazing history. Martin's work has also been included in the Society of Illustrators 24th, 25th, 27th and 30th annual shows in New York City.